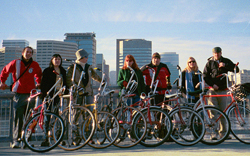 It’s summertime which means you’ll be seeing a lot more of Portland’s all-Schwinn bike gang the Belligerantes, and this year they’re celebrating their 15th Anniversary. These retro-loving riders roll out to events, cycling or not, all over town. The Belligerantes love participating in parades and any opportunity to show off their sweet bikes and stylish riding tricks. They arrive in style and park their bikes in one neat line, like Harley riders. The Belligerantes’ signature bike features dramatically high ape handlebars on an old Schwinn, known as the Mega-Ray. Their club motto is “If it ain’t Schwinn, don’t bring it in” but, truth be told, they say they have a soft spot in their hearts for all bike enthusiasts and as long as you’re on a bike, they’ll welcome you like family.